Ambien is a central nervous system depressant. It is the most commonly prescribed medication for insomnia. People who abuse Ambien may snort the tablets, or inject the drug. Effects of Ambien include drowsiness and relaxation. Withdrawal from heavy Ambien use can produce serious symptoms including seizures, hallucinations, anxiety and vomiting. Medical supervision is strongly recommended for people who have been abusing Ambien for a long time. Signs of Ambien addiction include tolerance, using Ambien in dangerous situations, failed attempts to cut down on use and taking larger amounts than intended. Ambien is a brand name for the drug zolpidem, which is a type of sedative-hypnotic medication.1, 2 It is the most commonly prescribed medication to treat insomnia. Ambien is a central nervous system depressant and can impair functioning even when taken as prescribed. Ambien can be misused in a number of different ways. Tablet form. Prescription forms of Ambien are available in several strengths, including 5 mg and 10 mg tablets. Individuals who misuse Ambien may take several pills at once, or they may crush the pills and snort the fine powder to feel the effects of the drug more quickly. Injected. Ambien can also be dissolved in a liquid solution, such as water, and injected either intramuscularly (i.e., directly into the muscle tissue) or intravenously (i.e., directly under the skin). These methods of abuse deliver the effects of the drug faster. With continued use, individuals develop a tolerance to Ambien and begin to need increasing amounts to prevent the emergence of an unpleasant withdrawal syndrome. Inpatient or residential rehab. These are programs where you live at the treatment facility while completing a rehabilitation program. They offer detox, therapy, education programs about addiction and medical treatment. Outpatient rehab. Outpatient treatment programs require you to attend group or individual therapy at a treatment center a few days a week for a few hours a time. People may transition into outpatient from a residential program or receive treatment exclusively through outpatient. 12-step programs. A sponsor helps guide you through a series of 12 steps to recovery and sobriety. Pills Anonymous is a 12-step program that helps people who have a prescription drug addiction. Dual diagnosis treatment facilities. Dual diagnosis programs can treat any mental health or medical problems you may be dealing with in addition to Ambien dependence. People who take Ambien usually struggle with insomnia, and a dual diagnosis program can treat both the Ambien addiction and the insomnia. Learn more about how to choose an Ambien recovery center. How long you attend the program. Whether you choose an inpatient, outpatient or 12-step program. What kind of amenities the program offers. Rehab options exist for those with insurance or those who need to pay out of pocket. With insurance. Call 1-888-319-2606 Who Answers? to learn more about your insurance coverage and confirm your treatment options. No insurance. Contact the Substance Abuse and Mental Health Services Administration’s toll-free helpline for help finding a recovery program. As with other medications, people taking Ambien feel mild side effects. Since it is a sedative medication, Ambien may also impair functioning in daily activities, such as driving. Rebound insomnia due to tolerance. Over time, Ambien abuse can lead to very high levels of tolerance. This means that the user requires ever-increasing doses to feel the desired effect or high. This, in turn, increases the risk for withdrawal and overdose.A study revealed that those taking hypnotics such as Ambien had more than 4 times the mortality compared to those who did not use hypnotics. One cohort study suggests that high-dose abusers are 35% more likely to develop cancer. Negative consequences at work and/or school. Anxiety, paranoia, increased agitation and hallucinations. Severe and potentially dangerous withdrawal symptoms. Medical supervision is strongly recommended for Ambien withdrawal. Withdrawal symptoms from Ambien begin within hours to a few days after stopping or reducing use.4 The duration of the symptoms depends on the severity of the addiction, length of use and dosage. Tachycardia, or increased heart rate. Who Answers? for information on treatment options. Ambien users are at high risk for developing tolerance and dependence. Medical practitioners should be aware of signs of abuse in their patients when prescribing Ambien to manage insomnia. Taking Ambien in larger amounts than intended. Failed attempts to stop or cut down on use. Spending a lot of time obtaining and using Ambien. Strong cravings to use Ambien. Repeated absences from work or school. Neglect of children or family. Continued abuse despite negative consequences. Use in physically dangerous situations, such as driving under the influence or operating a machine. The use of Ambien can prove to be habit-forming, even if the individual takes the dose exactly as prescribed by their doctor. 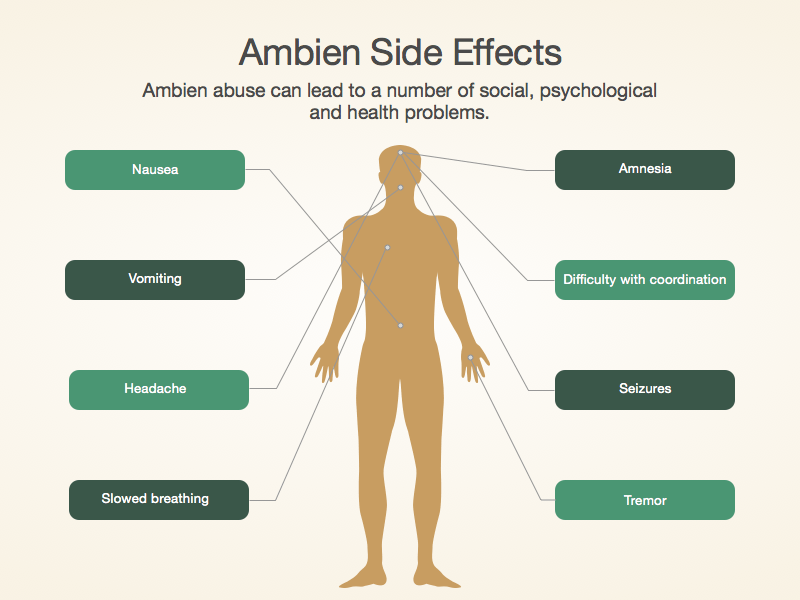 Misuse of Ambien significantly increases the risk for abuse and dependence on the drug. If Ambien abuse and dependence continues untreated, the individual is at serious risk for developing a dangerous and potentially life-threatening addiction. Despite the known risks, Ambien continues to be one of the most abused sleeping pills on the market. Overdose can occur with Ambien, resulting in depression of the central nervous system. If you or someone you know may be suffering from Ambien overdose, call 911 immediately or visit the local emergency room. Hypoxemia (low oxygen levels in the blood). Hypercapnia (high amounts of carbon dioxide in the blood). 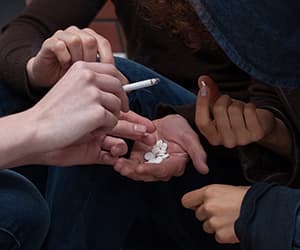 It’s estimated that about half of all teenagers falsely believe that it is safe to take prescription drugs rather than street drugs. This belief may lead teens to misuse prescription medications under the false assumption that they are harmless. Moreover, in a sample of 17,000 youth age 12 to 17, 1.4% reported having abused Ambien within their lifetime. Generalized to the whole adolescent population, this number equates to more than 300,000 teens abusing Ambien in the United States. Many treatment options are available for those struggling with Ambien abuse or addiction. Call 1-888-319-2606 Who Answers? to speak with a support specialist about recovery options.
. Hajak G, Muller WE, Wittchen HU, Pttrow D. (2003). Abuse and dependence potential for the non-benzodiazepine hypnotics zolpidem and zopiclone: A review of case reports and epidemiological data. Addiction 98:1371-1378.
. Victorri-Vigneau C, Wainstein FF, Grall-Bronnec M, Pivetter J, et al. (2013). Pharmacoepidemiological characterization of zolpidem and zopiclone usage. Eur J Clin Pharmacol 69:1965-1972.
. Darcourt G, Pringuey D, Salliere D, Lavoisy J. (1999). The safety and tolerability of zolpidem: An update. J Psychopharmacol 13:81-93.
. American Psychiatric Association. (2013). Diagnostic and Statistical Manual of Mental Disorders, 5th Arlington, VA American Psychiatric Publishing.